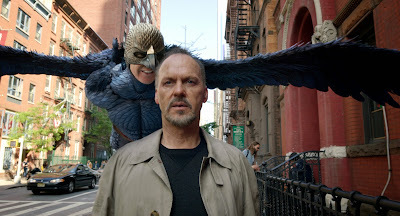 Birdman or (The Unexpected Virtue Of Ignorance) to give it its full title is, make no mistake, a comedy albeit a very dark one. It is the story of Riggen Thomson a once significant Hollywood actor who played super hero, Birdman. We find him, having left the successful super hero franchise producing, directing and starring in a play on Broadway. We are invited back stage and in doing so are immersed in his world while he fights to get the play to opening night. Actors are leaving, brawling, having emotional break downs and the presence of his wayward daughter are all leading him stray from the task at hand. The film also represents a fight with Thomson’s ego, a fight to stay relevant post superhero stardom. Performances by Michael Keaton as Thompson and Ed Norton as Mike Shiner, a difficult to manage method actor who turns up at the last minute to replace another actor and save the play, are energetic and tremendous. Undoubtedly their tasks were made a little easier as they could relate to the story of Thomson as both played superheroes themselves, Keaton was Batman and Norton the Hulk. There are big themes in this film, and it could be described as philosophical, but they are also many laugh out loud moments. Aesthetically it is a nice film to watch and technically wonderful, although in the first half of the film I was totally engrossed it does lose something in the latter half. Overall though an impressive, well-acted, directed and for me at least, thought provoking film.